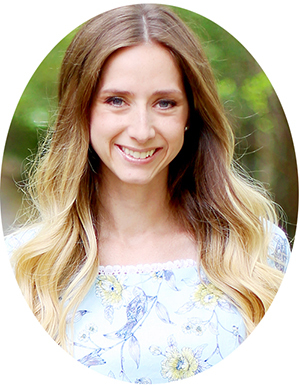 It seems like the majority of my post titles these days include the words floral and stripe. But, I still love the combination so I’m not going to give it up just yet :). 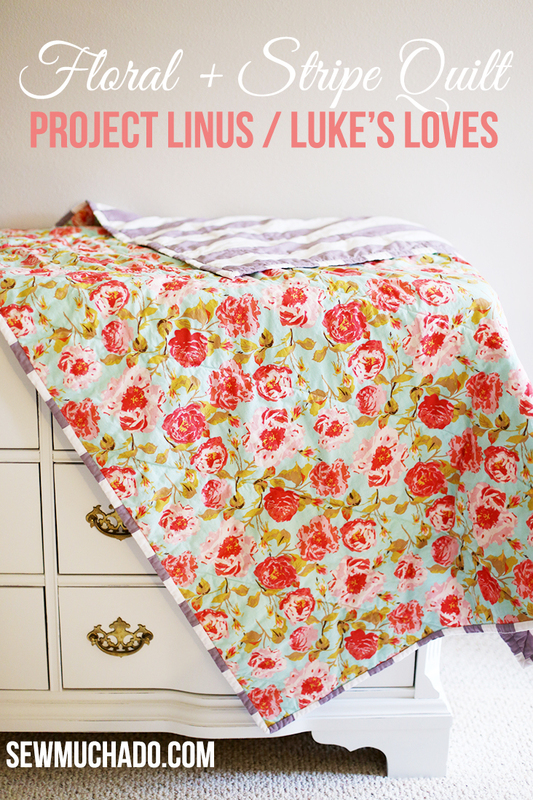 I’m really happy to get to share this post and quilt I made with you today, to help promote Project Linus / Luke’s Loves. 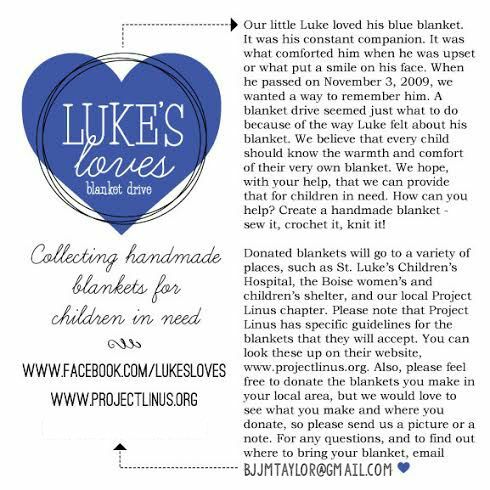 Project Linus collects and donates blankets to children who are seriously ill, traumatized, or otherwise in need. They provide love, a sense of security, warmth and comfort through the gifts of new, handmade blankets and afghans, lovingly created by volunteer “blanketeers.” It’s such a great cause! 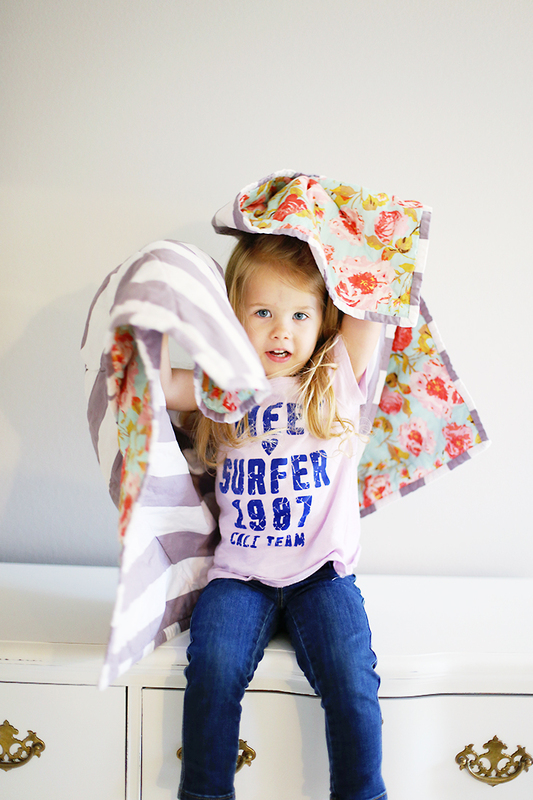 You can read more about how to get involved HERE on Kimbo’s blog, and help us reach the goal of making and donating more than 200 blankets to this wonderful project! 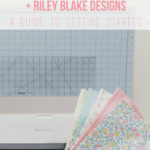 I knew I wanted to make a simple yet beautiful quilt, and Riley Blake Designs was so kind to send me over some fabric that helped me do just that! 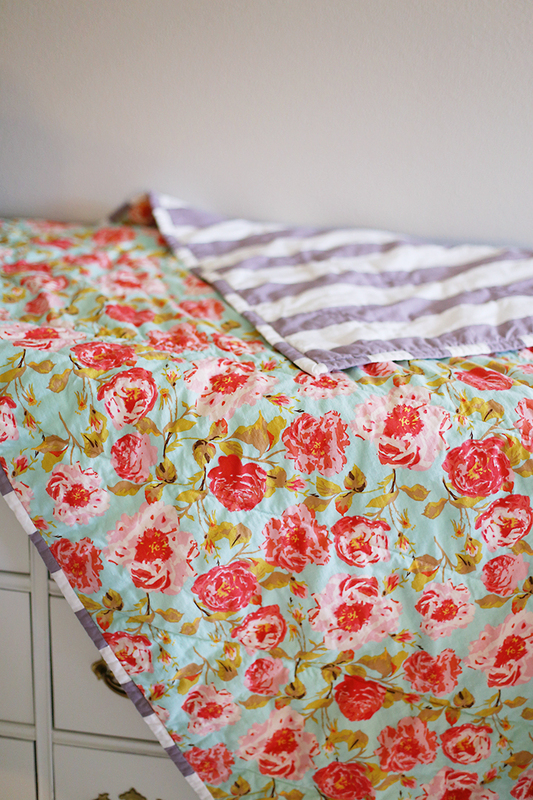 I used an amazing floral print from the Chatsworth line for the quilt front, and a gray/white 2″ stripe for the back and binding. 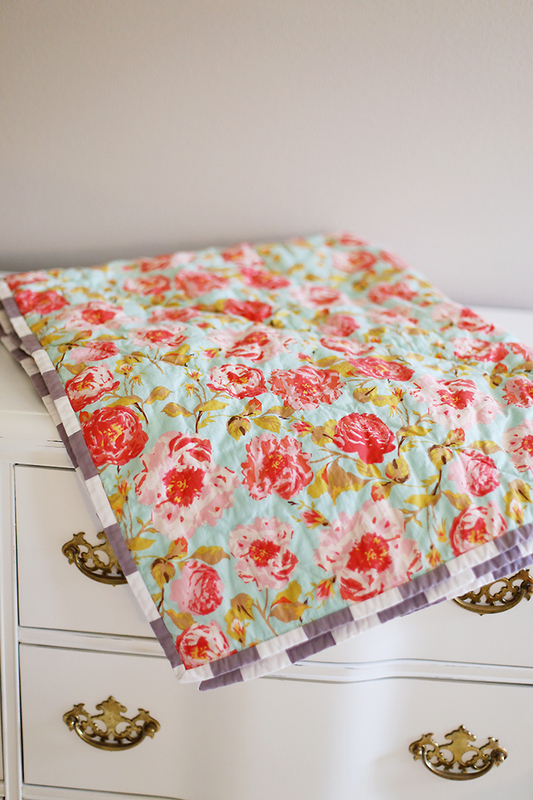 There’s something about a puffy quilt that I just love. It reminds me of the quilts I grew up with I think, and so I decided to use polyester batting instead of the cotton that I normally use on quilts. 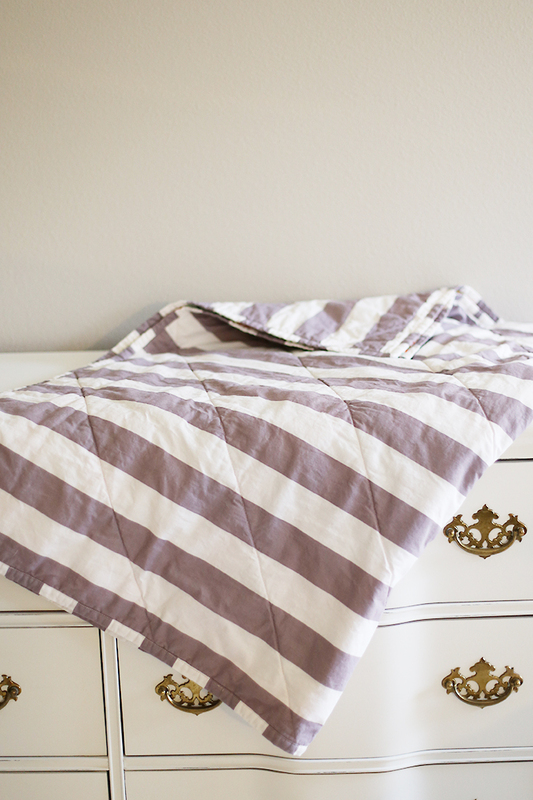 I wanted the quilt to be extra cuddly, and I like the extra body the batting gave it. The assembly was pretty straightforward. I sandwiched the batting between the front and back (which was cut a bit larger on all sides), spray basting and pinning them together. 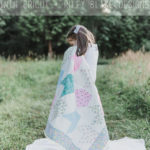 I originally really wanted to tie this quilt like I did recently with Hattie’s song lyric quilt, but I decided against it to save myself a trip to the store (please tell me I’m not the only one who makes sewing decisions that way?). Instead, I machine quilted every 6.5″ diagonally (to make it easy to draw the lines since my quilting ruler is 6.5″ wide). 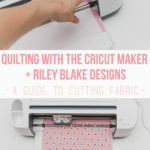 One of my favorite sewing tips that I used for the first time with this project is to use a washable marker (affiliate link) instead of a fabric marker, and it was awesome! Plus, it feels gooood to raid my kids’ craft supplies for once instead of the other way around :). 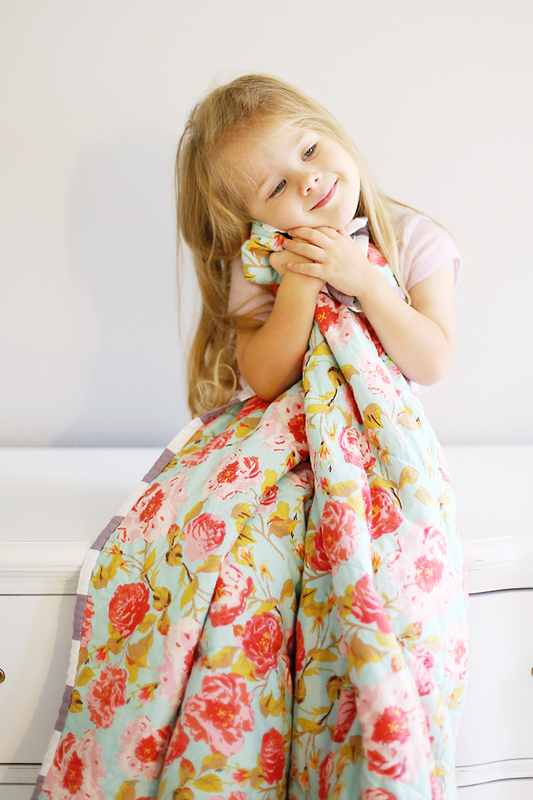 Also like Hattie’s quilt, I did machine binding, and other than having to unpick the stitches way more often than I should have, it worked out really well in the end. 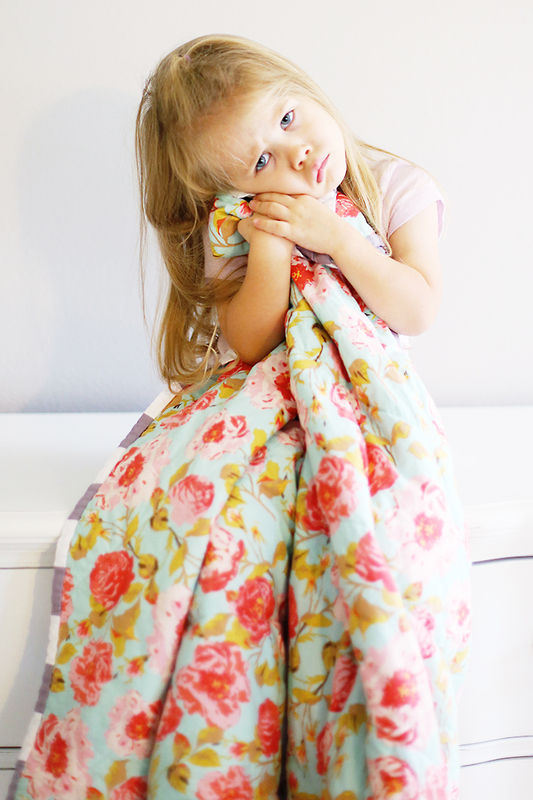 Lola was more than willing to help model the quilt. But I think this was the moment when I told her it wasn’t for her… I think I may be making another one! 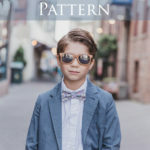 I really hope that this quilt will help inspire you to join in and make and donate a quilt of your own for Project Linus / Luke’s Loves! 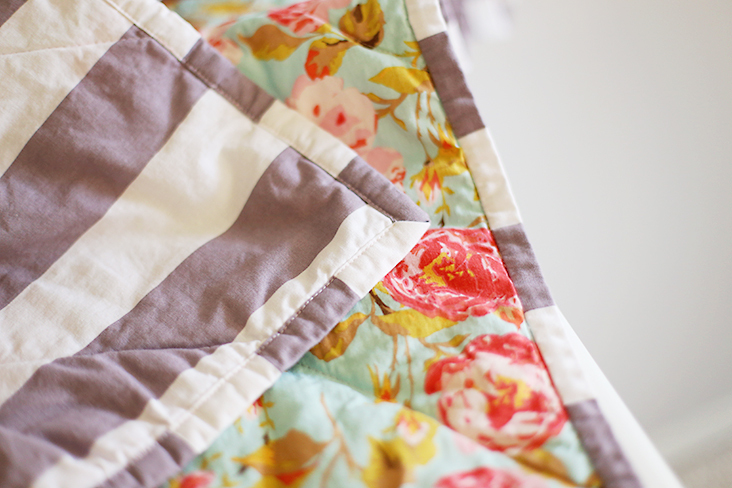 Find all the details and add your own donated quilts to the linky party HERE!